Photo by Plant Chicago, NFP/Rachel Swenie. In many former industrially important cities in the United States and around the world, solid old buildings stand empty — useless. But one green innovator is proving that such structures could instead be off-the-grid, zero emission urban food oases. John Edel is transforming a former industrial facility in Chicago’s historic Union Stockyard into a unique centre that is part vertical farm, part food-business incubator, part research and education space. The Plant, as it is known, is a complex food production system for raising tilapia, growing mushrooms and nurturing aquaponic vegetable gardens. It is also a hub for small artisanal food businesses like a bakery, a kombucha (fermented tea) maker and eventually a beer brewery. On top of that, this unique set-up will soon be running solely on green energy thanks to an anaerobic digester that will transform organic food waste — both from within The Plant and businesses in the surrounding community — into biogas that will power a turbine generator. This bright project blooms from an unexpected spot: an abandoned pork processing plant in a huge infamous former stockyard that was essentially the birthplace of today’s industrialized meat business. From the mid 19th through the first half of the 20th century, Union Stockyards was the site that spelled death for an estimated 400 million animals, as it was accessible to all railroads serving Chicago. Today, in the face of urbanization — not to mention concerns over fossil fuel use (‘food miles’, emissions, peak oil) and dwindling fish stocks — the 93,500 sq ft (8,686 m2) structure is ideally suited for indoor aquaponic urban farming. Further, The Plant is well-placed to provide an estimated 125 green jobs and help stimulate the local economy and food security prospects of an economically distressed Chicago neighbourhood known as Back of the Yards. 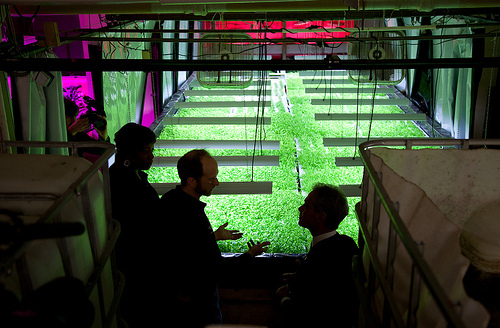 Mayor of Chicago Rahm Emanuel tours the growing system (March 2012). Photo: Plant Chicago, NFP/Rachel Swenie. So Edel knows his stuff, and could easily be classified as an exceedingly ambitious and resourceful guy. Having bought the building in 2010 for only $525,000, he has overseen its “deconstruction” — defined on The Plant’s website as “the careful removal of materials from a building with the intention of reuse”. Indeed, aside from boasting solid brick walls, being very well insulated and featuring a recently upgraded electrical system, the place also included lots of food-grade stainless steel, rubberized concrete floors and other materials that are being gratefully and enthusiastically repurposed during the long renovation process by The Plant’s staff, its “pack of volunteers” and its tenants. Edel says the whole project is about closing waste loops: with physical waste and things like gases, carbon dioxide and oxygen all staying within the facility. So nothing leaves the building but food. Aquaponics is a combination of aquaculture (fish farming) and hydroponics, or growing plants in water rather than soil. It capitalizes on the symbiotic products of each: the fish produce ammonia-based waste that is biofiltered into fertilizer that the plants absorb, cleaning the water for the fish to reuse. The Plant takes symbiosis even further too, with plans like growing mushrooms in brewery ‘mash’ (the grain that’s been heated in water to make the beer) and redirecting CO2 from kombucha fermentation to growing rooms. 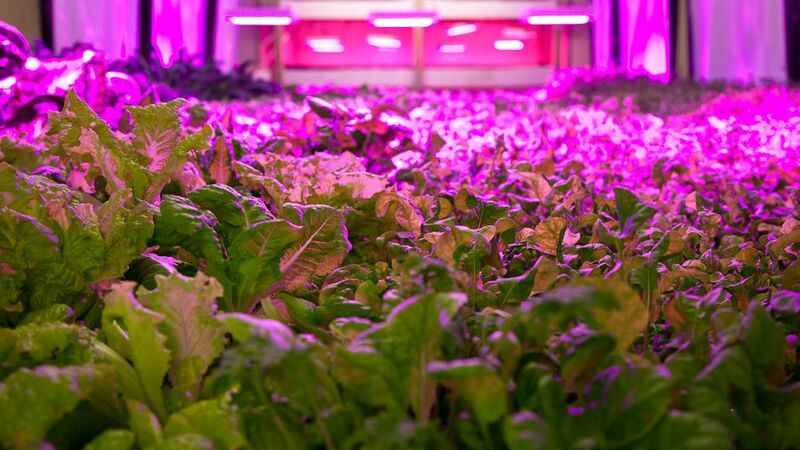 Normally indoor farming would entail high electricity consumption due to grow lights and temperature control needs. Which is exactly why an anaerobic digester is being constructed that will eat food waste and send biogas to a combined heat and power system to produce the electricity to grow plants and the heat to make beer. This ambitious undertaking, spurred by a US$1.5 million grant from the state of Illinois is being (re)built using a military fighter jet engine. The Plant will remain connected to the electrical grid and natural gas line, so as to have a backup power source and also be able to feed surplus electricity back to the public grid and thus achieving “net zero” energy usage. Of course there are some challenges too, but it seems those never stop Edel. Chicago’s municipal law forbids commercial fish farms (with fish classified as ‘livestock’!). Edel is, of course, pushing to have that changed. But meanwhile, aquaponic farming is permitted for educational purposes (which is one of The Plant’s goals anyway), so Edel set up a partnership with the Illinois Institute of Technology. Students learn about creating/improving a large-scale indoor growing operation, low emissions methods to power and heat a building and developing open-source control systems for such operations. Further, they have been developing the mushroom growing facility to produce Oyster and Lions Mane mushrooms (including set-up of an on-site laboratory to generate “spawn” for the new operation), as well as contributing to indoor and outdoor growing systems. So, when will The Plant be entirely up and running? 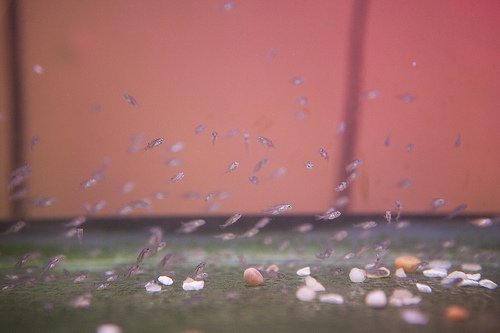 Tiny tilapia. Photo: Plant Chicago, NFP/Rachel Swenie. The building is becoming functional in stages. With three tenants right now (one aquaponic, one kombucha tea brewer and one bakery), the focus is on getting more in, with The Plant estimating that it will have five spaces fully built and leased by the end of 2012, and the renewable energy system up and running by June 2013. Nearly all of the businesses will be for profit, raising and preparing food. The major exception is Plant Chicago. The non-profit will conduct research and educate the public on sustainable food production, job creation, renewable energy use and green building renovation. So on top of using growing space for research, it will operate a shared kitchen (estimated completion in 2014), where the job creation will take place, and host extensive educational programming to teach adults and children about The Plant. The Plant’s commitment to sharing knowledge bodes well for the future of green enterprise. Once the entire model is in full swing, its energy-efficiency will increase the chances that it might spark a business trend, since Bloomberg Business Week already lists vertical farming as one of the top 20 businesses of the future. Here’s to bringing fresh green life into good old buildings. Symbiotic Urban Farming and Industrial Reuse in Chicago by Carol Smith is licensed under a Creative Commons Attribution-NonCommercial-ShareAlike 3.0 Unported License. Carol is a journalist with a green heart who believes that presenting information in a positive and accessible manner is essential to activating more people to join the search for equitable and sustainable solutions to global problems. A native of Montreal, Canada, she joined the UNU communications team in 2008 while living in Tokyo and, after relocating to Vancouver, continued to telecommute to Our World as writer/editor through 2015. The phrase “Vertical Farming” has become fashionable, but there is no such thing. Farming is basically collecting solar energy via photosynthesis, and the sun is essentially overhead. Also, this article seems to imply that the “wastes” from this indoor farming operation can generate the electricity for the grow lights (substituting for sunlight), and heat too – all while exporting a harvest of food. This contradicts the basic laws of thermodynamics. What is really going on, I presume, is that a lot of materials (grown horizontally on sunshine elsewhere) are imported to the site to feed the fish (and the mushrooms). The growing of plants under electric lights is a smaller side project here. The wastes originating from this imported feed, along with organic wastes collected from the urban surroundings (also originating from horizontal farming elsewhere) are combined as input to the biodigester. This is all nice efficient use of resources in an urban setting, but please don’t call it “vertical farming” nor “net zero energy”. The word farming is not necessarily synonymous with plants. Sometimes it is used in the sense of honey farm or cheese farm. Neither of these examples use the directly in the process of producing their product. The term vertical is just referencing a vertical expansion as opposed to a horizontal expansion like most farming. When it gets down to it, and I am being a little hypocritical here, but it seems like you are just nitpicking. Vertical Farming is a term that can effectively describe this process.